Out for a long run around Lake Georgetown with Andres, we had trouble from the start. Trouble finding the lake at all leading to a late start, then trouble finding and staying on the ridiculously overgrown trail, and trouble dealing with the triple-digit temps and high humidity. This was one of our longest runs planned in the TransRockies build-up and, despite all the difficulties, we were enjoying the day. We made it to the opposite end of the lake in less-than-stellar time but were happy to refuel from the coolers we had dropped there hours earlier. 13, maybe 14 miles into the run and we were on our way back to complete the expected 26 or 27 mile long run. For the next hour or so we were hurting a bit but still having mostly fun, chatting about genital chaffing and debating his level of Mexican-ness. Then things went a bit off-course. Yes, we literally went off-course and struggled to find anything approximating the scheduled route. But, at about 24 miles in, with me running a few yards in front, I ducked under a thick tree branch that went over the trail. At least I though I did, until I looked up from my back, hearing nothing but Andres’ laughing. I didn’t feel hurt but it was, without question, the hardest hit I’ve ever taken to my head. You see, the branch – more like a limb, with a diameter of at least 6 inches – was about 5’5″ from the ground. Running full speed on a bit of a downhill I ran up to it and ducked, where the top of my head was at about 5’6″ from the ground. The math just didn’t work in my favor and, BOOM, bad news. One of the contributing factors was the wide brimmed hat that, while great at shading face and neck from the brutal sun, also (apparently) obscures vision. It did, however, give me about 2 millimeters of cushioning, as well as a bit of continuous compression on what we quickly realized was a melon-busting impact. But, in spite of ourselves, we were still having fun. That is, a couple of miles later we realized we were not on the trail we intended and we were still unknown miles from the end. That’s when it started getting a little scary, as we both found our Camelbaks completely dry (we found out later that I had sucked so hard on mine that it crumpled into a wrinkled pile at the bottom of my backpack). Both of us were tired and dealing with not-insignificant dehydration after 6 hours of running in the blazing sun. 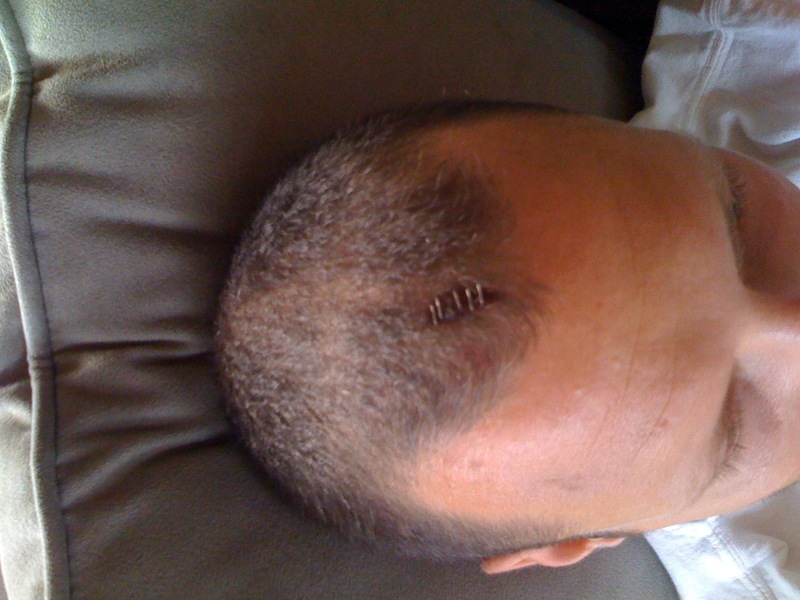 My head injury wasn’t helping but it wasn’t the biggest concern at the time. Getting desperate, we drank the warm, dirty water from the bottom of a bag of grapes we had eaten hours before. We were really getting near a danger zone and we both knew it – I was, um, losing “mental acuity” and Andres was just enough stronger to be worried about getting us both back. Without any idea where the intended trail was, we found our way out to the road and were able to hitch a ride with a kind, 100%-Texan, truck-driving man, who got us back to our starting point. While in the truck both of my hamstrings cramped into tight little balls and I used what mental strength I had left not to cry out loud. Once back to our vehicles we downed about a gallon of Gatorade in maybe 2 minutes, cooled off, and celebrated our own greatness. We tallied about 29 miles, which was a lot for us but no distance record. It was the conditions that did us – well, at least me – in on the run but we’re determined to get back out there to run it right, and in a lot less than 6.5 hours. Oh, then I got to go to the emergency room, again. The third time less than 7 months, all from injuries incurred on the beautiful trails of central Texas.